Aunty K n'Em(tm) in Pigsburgh(tm) introduces its young listeners to themes of self sufficiency, facing fears and overcoming obstacles in everyday life in an entertaining and positive manner. Ada C. Washington, writer/songwriter/composer, created the original music of “Aunty K n’Em™ in Pigsburgh™.” Ada has been creating, performing, and teaching music since 1972. She is a native of Shreveport, Louisiana, holds a Bachelors of Science in Music, and a Masters Degree in Education. Ada is a wife, mother of two adult sons, and she lives in Flint, Michigan. While “Aunty K n’Em™ in Pigsburgh™” is Ada’s first commercially published work, it stands among several children’s musicals and songs that she has written, composed, and performed locally. Notably, there are “The Apple Fudggie™ Festival,” and “The Three Little Pigs.” At one point Ada worked with a group of elementary, middle school, and high school students who performed in concerts and musicals under the name “Miller’s Kids.” After producing a number of commercial children’s musicals, Ada decided to write her own original musicals. 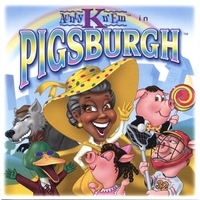 “Aunty K n’Em™ in Pigsburgh™” is a unique CD that taps into the hearts of its listeners as they follow the magical journey of Palmer, Polly, and Pigszy Pig who encounter real life issues of, self-discovery, self-sufficiency, separation, and triumph over obstacles in an entertaining and positive manner. This CD is based upon the soon to be published book, “Aunty K n’Em™ in Pigsburgh™” a whimsical children’s journey into fantasyland. The character of Aunty K is everyone’s favorite aunty who loves and encourages her way through Pigsburgh™ with eclectic music styles, including rock and roll, jazz, do whop, and calypso. Ada’s CD contains 27 tracks and offers 68 minutes of musical pleasure. The first 17 tracks tell the musical story. Tracks 18 through 27 highlight the musical talents of its outstanding musicians. When Ada sings, as she does on tracks 2 and 12, you may notice, as others have, a similarity in singing style to that of Natalie Cole. The predominant theme in this CD is, if you do your very best anything is possible, and dreams really do come true. This a highly entertaining CD that is fun and engaging. The songs will remain in your head long after the music has stopped and you'll find yourself humming the tunes throughout the day. When my then 19 month old grand daughter heard the first track of the CD for the first time, she clapped her hands and said yeah... She continues to clap at the end of tracks when she hears them. I'm recommending it to family, friends, students and musical professionals that I know and planning to give it as gifts for various ocassions. Great Job!! Ada, Way to Go.